← Teaching Kindergarten: ABC’s, 123’s, and OMG’s! I’ve met a lot of new friends and people since I started this blog. I’ve read some awesome and inspiring words. Months back, when I prayed for the Lord to send me an opportunity to share my words with others, I had my own picture in my mind of what that would look like. God had a bigger picture. His was bright and vibrant, where mine was gray and dull. His was unique and exciting, where mine was filled with the same colors and strokes as before. I’m so glad that I accepted God’s picture. His opportunities are endless! One opportunity that God provided for me to share my words was through this blog. I. Love. Blogging. It has become one of my favorite activities. I’ve gotten to read some wonderful words for living through visiting friends’ blogs. One such blog that I especially have enjoyed is by a friend named Carl at theoldfellowgoesrunning.com. Carl has some wonderful topics to read from, such as “Running”, “Health”, and “Environment”. He has some inspiring and wise words for Christians as well. 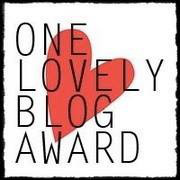 I was honored when Carl nominated my blog for the One Lovely Blog Award. Coming from a writer like Carl, this was especially meaningful to me, and I happily accepted the award. The rules for accepting this award are simple. 2. I love words. I love to write words. I write songs, lists, stories, articles, lesson plans, letters, and devotions. I love to read words. I first fell in love with reading as a fourth grader who found a “Babysitter’s Club” book in the school library. You can imagine my delight when I realized there are over 100 Babysitter’s Club books. Some of my favorite authors include Janette Oke, Karen Kingsbury, Francine Rivers, Denise Hunter, and DeeAnne Gist. 3. I teach words. I teach them to my favorite kindergarten students every day. I have a dream job and I sometimes sit back and think “I am actually getting paid to do this”. There is nothing like watching a five year old realize that he/she has unlocked the door to the world or words. Nothing. When a child learns to read and write words, he/she can become anything he/she wants to be. 4. I am married to my best friend. We met when we were fifteen years old and even though we didn’t speak to each other at that meeting (we made eye contact for, like, one second and then we both quickly looked away), I went home knowing I was going to marry him. Seriously. And I did. And he’s my best friend. 5. I have two of the sweetest sons in the world. They are almost exactly two years apart and they are each other’s champions. They love each other. They fight with each other. One cries when the other one is getting a shot at the doctor’s office. They play together constantly. They are my double blessings and they give my heart so much joy that it wants to burst sometimes. 6. I just released a CD entitled Paige Givens (creative name, I know:)). It contains original songs that I wrote and hymns that I arranged and adapted. It is $10.00 and can be ordered on Amazon.com. 7. I am a born-again Christian. Even as a Christian, I faced enemies of fear, anxiety, self-consciousness, and loneliness. But then I turned those things over to the Lord, and He replaced them with Himself. And with Jesus comes joy, courage, rest, hope, and confidence. If you are not a Christian, all you have to do is pray and admit to Him that you are a sinner, believe that He is God’s Son, and confess that He is Lord over your life. Ask Him to live in your heart today, and He will. If you don’t know who this Jesus is that I speak of, email me at paigegivensmusic@gmail.com and I will tell you! 11. Family to the 5 Power! Check these great blogs out today! Blessing, friends! Was just reading along in my WordPress Reader when there it was! 🙂 Paige, thank you for your kind words, thank you for sharing about yourself, your precious family, and your faith in Christ. Blogging is great, and I look forward to continue to read your posts….and checking out the bloggers that you enjoy and recommend. Thank you for the recommendations. I’m leary of all that is out here. This will give me some tried spots to visit. LOVEING your CD!